My friend Mark bought me a 1:48 Hawker Sea Hurricane to go with the Vallejo set of Coastal Command paints. I have related how the undercarriage got broken and how it had to sit on a Trumpeter "flying" stand. Was it needed, though, was a pilot. Fortunately, I hadn't thrown the plastic away, so I was able to retrieve the pilot from the kit (good old Airfix still gives us pilots!). I painted him up and gave him a"Flying Officer Kite" handlebar moustache. (Flying Officer Kite was a BBC Radio character from 1947, supposedly with a handlebar moustache). 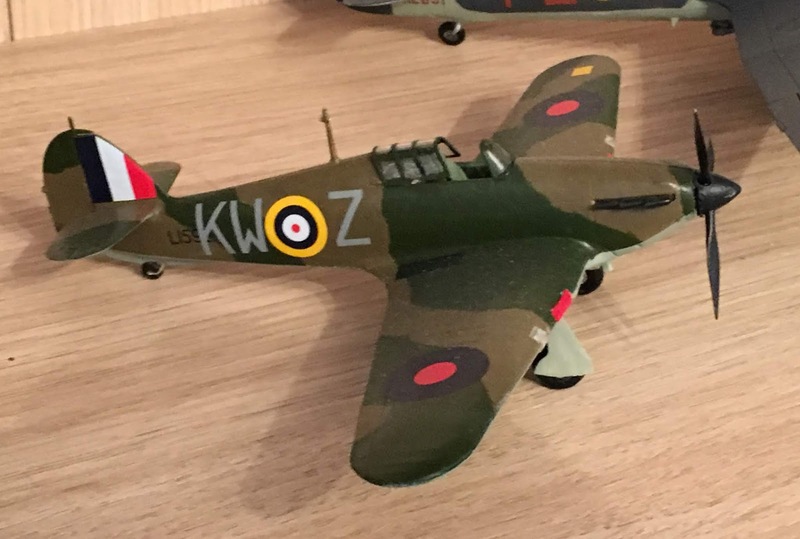 Next up is a Mk.I Hurricane, again from Airfix. This one is straight out of the box. I then got started on my little BanffStrike Wing series. 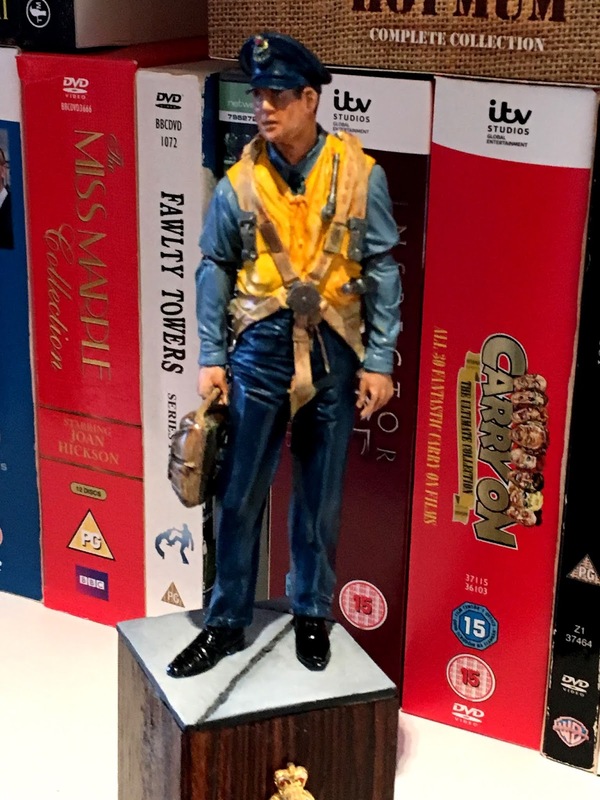 First off is an Airfix 1:72nd scale N.A. Mustang IV (P-51D) in 65 squadron markings. This was a fun project. I had to research the camouflage pattern -"Firewall", it seems but reversed on this plane. The chosen aircraft was one that was crash landed in Sweden after a battle with FW190s over the Kattegat. 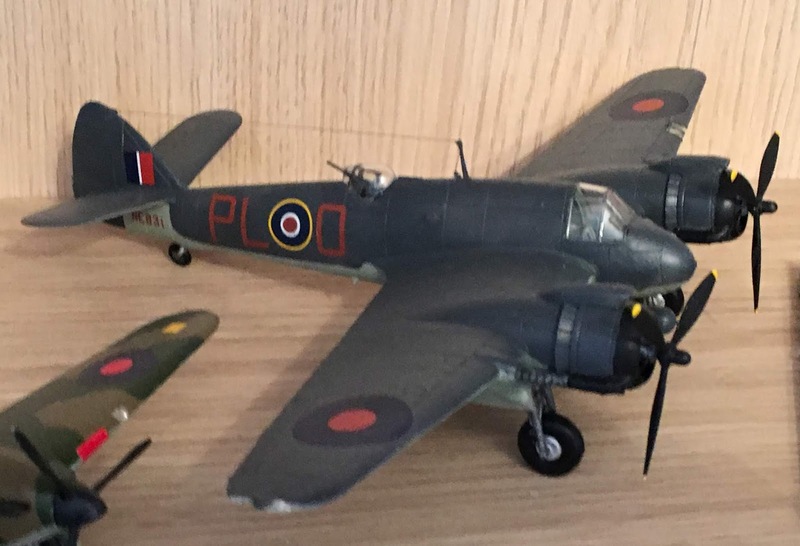 I also had to construct the serials and squadron codes from alphabet sets as there are no 65 squadron decal sets available. 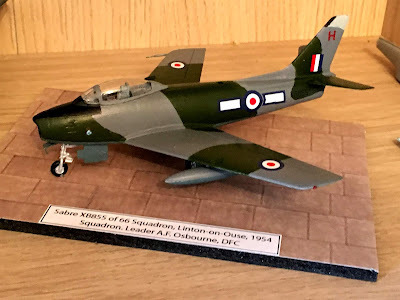 Lastly, it seems that the aircraft was painted in the US before shipping so the colours aren't the regular Ocean Grey, RAF green and Medium Sea Grey but US equivalents. Fortunately, the Xtracrylix range has the correct FS colours so I was able to finish it off correctly. Next in the Banff set is a "TorBeau" - a torpedo armed Beaufighter X. Again, I worked from a photo of a crashed plane - this time one damaged in the famous "Black Friday" episode over Norway. 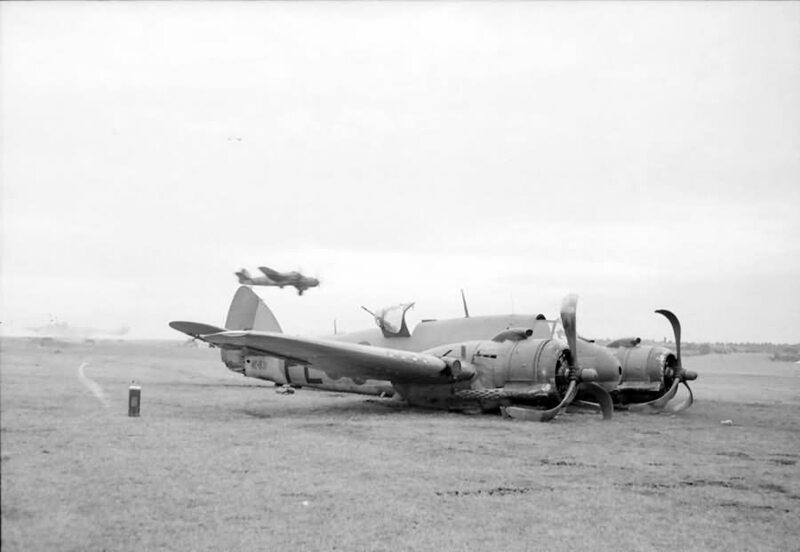 The chosen aircraft was PL-O of 144 squadron, which crash-landed back at Dallachy after being hit by a FW190 and managing to fly back from the Norwegian coast with substantial damage. Again, I had to handcraft the serial and squadron codes for this one. Lastly, in the series of completed planes comes a 66 squadron N.A. Sabre. This was made for the themed night at Ipswich IPMS last week. As usual, I got very little recognition of my presence or of my contribution, but there we are. 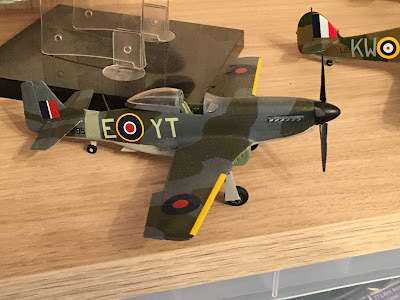 I bought the Hobby Boss (HB) kit, forgetting that it was one of their "easy" builds. I managed to break off the pitot tube and gave up on it fairly quickly. I then purchased the Academy kit but found that it was even worse than the HB one. I retrieved the pitot tube and fitted it to the HB one so that was, at least, complete. 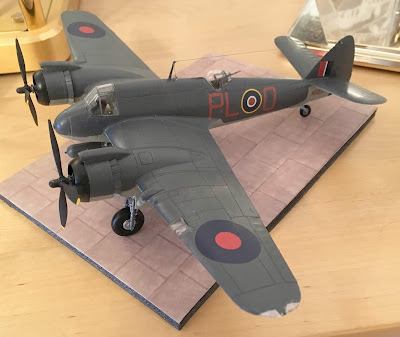 I purchased a set of RAF decals as I wanted it to be a bit different from how I expected the table to go. I had to fill the nose with lots of liquid lead but it still needed a little bit of tacky-wax to hold the nose down. I don't expect to get any points in the competition, even though it was one of only four completed Sabres on the table. So, that is it for now. 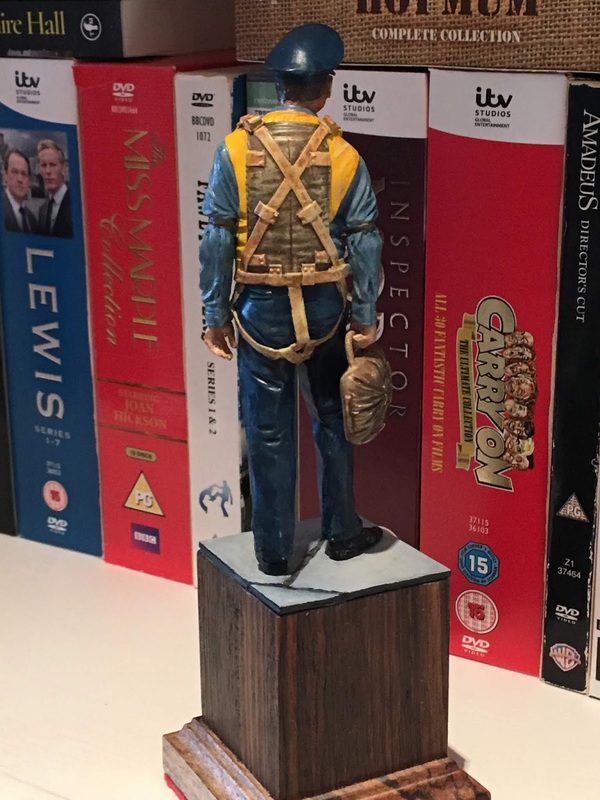 except for one 120mm resin figure that has been sitting on the shelf for about 18 months after my friend Mark gave it to me to "finish" When I got it, it was complete and mounted on a stand and had been undercoated. I started to paint it but lost confidence in being able to finish it correctly. Recently, I decided, in my new frame of mind, that I would restart it. 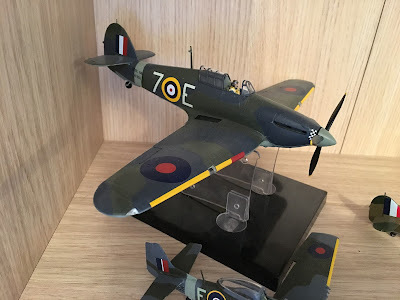 I managed to find good quality images of the finished model on the maker's web site so off I went. I am very pleased with the final result. Now I see photos, I realise that it needs some more matt varnish to take the shine off. More on these in the next post.